Taking a leap of faith. That’s a decision that many Christians face. However, having the conviction to follow through is often easier said than done. That’s not the case for the Suon family (Husband Jason, a 1996 graduate of Wauseon HS, and wife Becky, a 1999 Liberty Center alum, along with children Finn (10), Paisley (9), Stacia (6), and Moses (3)) of rural Wauseon. On the contrary, the “Suon Six” are pursuing the special passion they have for the people of the Dominican Republic. A passion they feel so strongly about that on January 23, 2017, they are leaving the comfortable life they have established in Fulton County to live and serve there full time as missionaries. At the time of Jason’s initial trip to the Dominican Republic, Freedom International Ministries had just purchased 25 acres of ground. 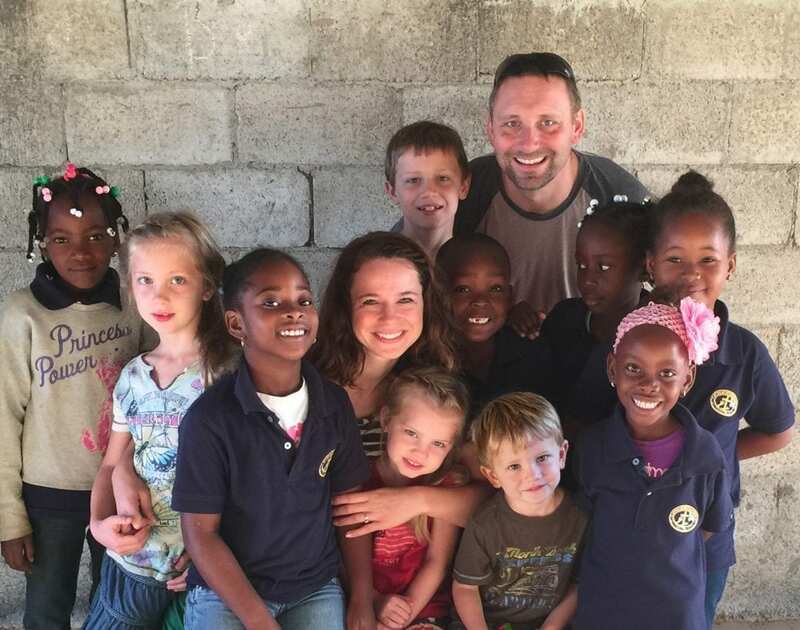 While there, Jason and his team built the first two classrooms of a school building for Haitian immigrant children living in the sugar cane bateyes. Jason shared, “When we got there, the land was flat, with only the footers being dug. When we left 7 days later, we had built the first two classrooms with a bathroom that separated them”. When asked what led them to making the final decision to leave everything here and move to the Dominican, Becky shared the journey. “After two years of watching the ministry grow, we had the opportunity to get together with Kurt (an Archbold native) and Katie Cline, who are serving full time with Freedom. Kurt explained to a group that Freedom’s greatest need wasn’t necessarily money, but people. They needed more people to help the school to grow (it is in an ongoing state of construction) and he asked specifically for prayer for a preschool director. By this time, Jason and I had several times of hovering over the computer, checking flights, and many conversations about whether we should go and check out the ministry as a family. We just couldn’t pull the trigger on it. After getting together with Kurt and Katie, we knew that we needed to just buy tickets and go. This thing was not going to go away, much to my chagrin, so we purchased tickets and boarded a plane two months later. That was exactly one year ago. Becky continued, “At first, this was really hard for me to wrap my mind around. We love where we live, Jason has a great job, I love our little life of homeschooling and wannabe homesteading. Picking up and moving was something I fought for a while. We are happy here in our little country farmhouse and things are predictable. Moving to the DR… not only is it a huge endeavor to raise our team of supporters, but there has been fear of the unknown, leaving our friends and family and the comforts of America won’t be easy. My heart changed after we went to the DR and once I saw how hungry those sweet children are for real relationships, I couldn’t turn my back. I am a person who has always had mentors. In my mind, that’s what they need. When we were in the DR, I saw something in a little girl that I can’t forget and I can’t describe. In her glassy eyes was a hunger for a relationship with me. I believe that the ministry we are serving with is giving Hope and meeting the love needs of children that are in great need… and I believe that is happening through relationships. I believe that those relationships are worth campaigning for. The children that we are serving are being intercepted from a life void of hope, illiteracy, and the certainty of poverty. We love Jesus and are daily seeking to live for Him. He has placed a special passion in our hearts for the people of the Dominican Republic… so we are going– to live there and serve there full time! The Suon’s will not be alone in the Dominican. Currently 5 missionary families (All from Ohio or Indiana) associated with Freedom International are serving full time on the ground in the DR. There is one additional family that is raising funds to make the move as well. The Salsbery family from Sharpsville, Indiana, hopes to be fully funded and on the ground in May 2017. Interns also are extremely important for the ministry of Freedom International. Young people that will come for any length of time are needed and welcomed. They have real life responsibilities and the opportunity to impact children by serving as classroom aids, construction workers, or other areas they are gifted in. With the help of short term teams, Freedom was able to build a missionary apartment building on the 25 acre campus which serves as housing for the missionary families. According to Becky there is a lack of typical comforts, and many inconveniences, but their 3 bedroom apartment is a far cry from a shack in the village. The school is located near Ramon Santana, just outside of the sugar cane plantation area. A bridge separates Ramon Santana from an area that opens up into 240,000 acres of sugar cane fields owned by Central Romana (Domino Sugar). To put that into perspective, that is about the size of Fulton County. Within that 240k acres, there are around 120 bateyes peppered between the fields. There is a railway and many weigh stations scattered in there as well. Of those 120 bateyes, Freedom International currently has children coming from 6 of them, so Becky stresses there is a HUGE opportunity for growth of their school. As most would imagine, the conditions in Ramon Santana, and especially in the migrant camps, are far from ideal. However, the move to the Dominican Republic is an upgrade for most of the Haitian migrants. According to Becky, all of the families have settled from Haiti, some more recently than others. The mentality among them is they are going to eventually leave for a bigger and better opportunity. Becky provided a graphic description of the people and the area. “Well, yes, comparing them to our standards they (the conditions) are deplorable. They are living in dark one room dwellings that are overcrowded and sometimes they even run small businesses out of them. People are very “creative” there. You have to be. They own so little. They do not own their houses. You see moto’s that drive back in that area sometimes and I even saw a few people on horseback, but they do not own vehicles. It’s a rural area. They don’t have plumbing or running water and modern electricity is rare. There is a lack of potable water. Each village has a concrete slab with a hole in it that they use as a bathroom. They have a company owned store called a colmado in each batey that sells packaged food, pop, beer, and other items. Although limited, the people do have other options for employment. Becky elaborated on these options. People jump at the opportunity of outside labor. Sugar cane cutting is backbreaking work done by hand with a machete in the heat. There aren’t tractors, there are ox carts and wagons. Weeding is done by Haitian migrant workers, as that is a job that is not desirable to a Dominican. As a ministry we provide work for as many of our school children’s parents as possible. We use them sometimes in construction, we have Dominican teachers, our language training will be done by a native Dominican, the school cook is mom to one of our students… we do our best to help them in that way. It isn’t super common for the village people to get outside work, but if they do get a job outside of the batey, it will often lead to them displacing their children so they can work in the city. The “Suon Six” can be followed on their journey at their website, www.suonsix.com. Additional information on Freedom International Ministries can be found at www.itisforfreedom.com. Anyone wishing to support the Suon’s cause can do so through either site. © 2016, Kent Hutchison. All rights reserved.